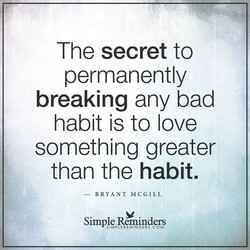 The ego loves our habit, it talks about it to us all day long constantly to remind us what it is. Heaven forbid we might forget and let go of something that we do habitually, says the ego! If it wasn’t for the persistent and obnoxious ego noise there wouldn’t be a habit in the first place. It is only our mind that longs for the wanting of what it is we wish we could give up and be done with. Whatever our tendency was when our habit was born where was our ego then, certainly not shouting at the top of its lungs ‘this can develop into a bad habit don’t do it’, quite the contrary our ego had all the excuses as to why it was a good idea with no mention of the word habitual at all! If you have a habit you wish you could be free from ask yourself when it started, then look back at the reasons why you started it, does your reason still fit your life today? There has most likely been a lot of change over the years so why have you carried your habit along with you when it clearly is an old thing from the past? This is exactly how our ego tricks us, it loves to chew on the old stuff in our lives, ‘the past’ are its favourite words and dragging us back into what should be former forgotten drama, still becomes its finest work and our worst negativity. The ego loves to play on our emotions as well, and this is exactly what triggers the pattern of our habitual ways so it is really important to become aware of what the triggers are if you want to be rid of your habit for good. What is emotionally going on when your mind signals you to your habit? Develop a substitute plan for yourself, change up your routine a little so the ego gets confused. Once you are consciously aware of what it is you keep repeating you already have the power to change it. Habits can be confusing to us, we know we don’t want to keep doing what we do, but it seems the power to stop is just not there. Let today be the day when you take the first step in breaking what has been bugging you for a very long time.